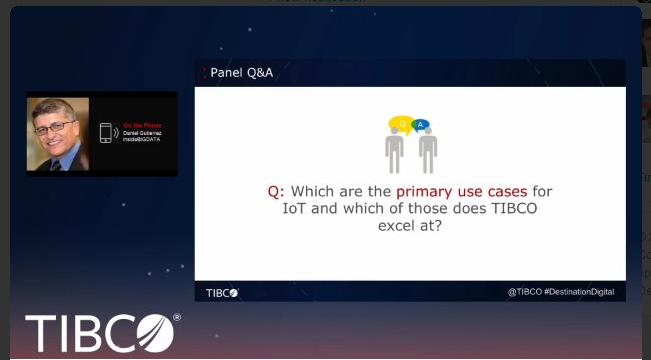 I was happy to be enlisted by predictive analytics giant TIBCO to be a panelist for the upcoming webcast feature “How IoT Analytics can Drive Competitive Advantage” on March 3, 2016 at 11am PT. I’ll be on the panel along with industry luminary Mike Gualtieri of Forrester Research and TIBCO’s Chief Analytics Officer Michael O’Connell. The webcast will give attendees the opportunity to learn how digital businesses are capturing greater value from big data and real-time data streams for sharper insights, real-time decision-making and competitive advantage. To register for the webcast click HERE.